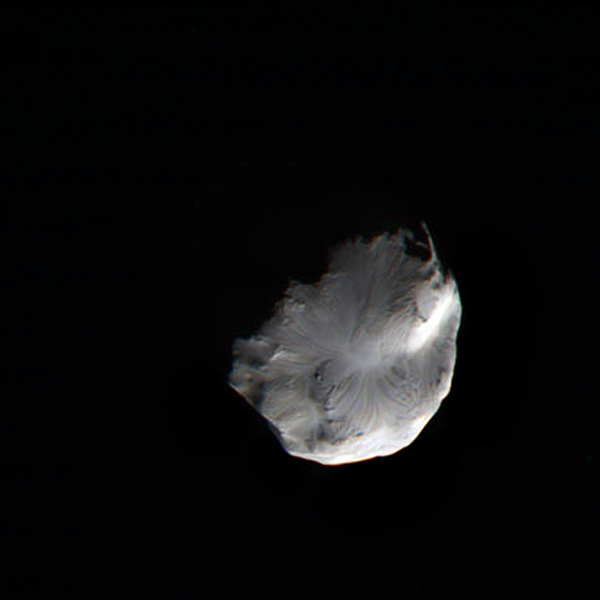 The image here shows some really interesting texture on Helene…grooves running outwards from a central point on the little moon. I’m not sure what side of Helene we are looking at here, but it would make sense if this were its leading face that we are seeing the result of motion into its orbit, perhaps the result of meteorite weathering or some other debris falling onto it along its path, maybe material ejected from Dione? This is a crop of a raw image acquired by the Cassini spacecraft on January 31, 2011, during a flyby of several moons in the Saturnian system. Cassini also visited Mimas and Enceladus, getting some very nice images of those worlds as well…I’ll post some of those later today! This isn’t the closest Cassini has come to Helene, either…that happened back in March of 2010 when it passed by at a distance of about 1,200 miles (1,900 km). Image: NASA / JPL / Space Science Institute. Edited by J. Major. Update: the image above is now an RGB color version, assembled from three separate raw images.